Easter is one of the most important Christian holidays, but realistically it’s something we’ve all adopted as an excuse to indulge in lots of chocolate, some great family dinners and the giving and receiving of gifts… because what’s not to love?! Most universities have a small break over Easter (course and location dependent), not least taking into account the Bank Holiday Monday. But whatever you’re doing to commemorate everyone’s favourite chocolate-y feast, it can be easy to see your spending spiral as gifts and bills rack up and suddenly you feel under pressure to provide for all. Never fear, skint readers, for Student Discount Squirrel is here… and despite the Easter Squirrel not quite being a ‘thing’ yet, we’re determined to make it so. So, where best to shop this Spring? We have the bargains to make you sing! When you’re considering your Easter shopping list, Iceland likely wasn’t the first retailer that popped into your head – but there’s plenty in-store not to be sniffed at when it comes to seasonal sales. They have just about supermarket Easter Egg you’d find elsewhere, as well as a whole range of chocolate novelties small and large. Prices start from £1 for an egg up to about the £10 mark for a luxury buy, and there’s lots of other assorted sweets and chocolates to stock up on. If you’re taking part in – or worse, hosting! – a traditional Easter Sunday lunch, Iceland also makes for the ideal shopping destination. Their roasting joints can often be cooked directly from frozen, and there’s plenty of great alternatives for vegetarians and vegans alike. You can buy all of the ingredients of a great roast for a fraction of the price that you’d pay elsewhere without compromising on taste… and that’s why Student Discount Squirrels go to Iceland. OK, so not really a budget option, but the perfect place to buy an Easter gift for someone you’re really looking to spend on. Hotel Chocolat is the ultimate in cocoa indulgence and there are smaller, cheaper options if you really don’t have the cash to splurge. Their extra thick filled Easter Eggs are £27 and make for a really special gift, but for the utmost in luxury choc, the Ostrich Egg comes in at £80 and comes in an elegant gift box and with a whole box of chocolates to boot. If you’re celebrating Easter the day after the actual event, or not seeing someone you’re giving an Easter gift to until afterward, Hotel Chocolat can become a lot more affordable. Nip in-store in the days following Easter Sunday and you’ll find any left-over stock gets heavily discounted… but of course, the recipient of your present never need know! Amazon love a good sale event, and they celebrate the birth of Christ by… well, slashing prices. The Spring Sale for 2019 is set to host a whole heap of bargains that you can take advantage of to buy gifts for others or for yourself. In some cases, some of the buys may even make for a great investment for your everyday work and life. Now, we can’t guarantee what will be on offer and what won’t, but Super Spy Student Discount Squirrel has some inside information. The all-new Echo Dot (that’s the latest in Alexa smart speakers) comes extremely highly-rated by tech early adopters and is expected to retail for less than £30 during the sale period – that’s £20 off the RRP, which is unheard of for tech this fresh. If you’re a Google user (and who isn’t?! ), you won’t be able to go without it! Other expected reductions include the Amazon devices (so that’s Kindle Paperwhite, the Echo, and the Fire TV Stick), Amazon Music, Amazon Prime, and flash ‘lightning deals’ across Home, Garden and Tech departments. In the case of the latter, be sure to check back regularly if you’re looking to make a purchase on a set item… as if it features, you’ll only have a short period of time within which to take advantage of money off. Now here’s a Great British high street name we can all get on-board with this chocolate-y season! Yes, Thorntons is a family favourite to, well, everyone, and if you’re after a name or message to be iced across anything in the brown stuff, it’s the place to go. The Easter range for Thorntons this year includes Eggs (duh!) of all sizes, chocolate bunnies, chocolate boxes and even Easter-themed bouquets of flowers (online only). You can also find options of chocolate gifts for vegetarians, vegans, those with allergies and dietary requirements and those looking for reduced or no-sugar chocs. 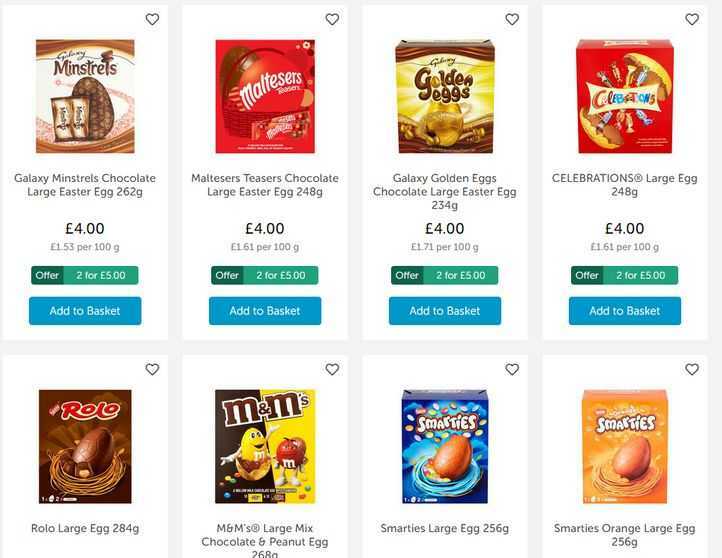 All can be personalised and shopping on the Thorntons online shop means you can also choose to have them dispatched direct to the recipient, to save you doing some kind of Easter-bunny-esque trip around the houses to drop everything off. Again, Thorntons often over-stock, so if you’re celebrating after the big day, nip into store for some great reductions. Of course, as with any non-essential spending, the main thing to consider is how it will affect your bank balance. Are you in a position to buy just one more Easter Egg? Should you really be splurging on flowers for all and sundry? Make sure that gifts are necessary and appropriate to the occasion, and, if they are, that you’re buying them as responsibly as possible – and that goes for price as well as retailer! Here at Student Discount Squirrel we’ll be updating the site as new sales and offers go live and, as with any occasion spanning a Bank Holiday, there’s bound to be some you’re not expecting. Bookmark the homepage and check back before any spending; because if we want to do anything, it’s to help you save. And anyway, that means more chocolate for you… right?